This past week was quite hectic with a few nights of getting home later than usual so I did not take the dog out on her regular long walk on Wednesday or Thursday. When I walk the dog the long route, we pass by the mailbox, and I pick up mail. Since we didn't go by on those two days and since it's not conveniently located, I didn't pick up Wednesday's or Thursday's mail until we walked by Friday after work. With the midterm elections quickly (thankfully) approaching, we are inundated with campaign ads both on TV and through the mail. The junk mail is bad enough when we're not in election season, but when we are it's not a good idea to skip mail pick up. It doesn't seem so bad when it's picked up and tossed out on a daily bases. After three days accumulation, it's appalling. There are 21, mostly full color, campaign mailers in this picture. The majority of them are the size of a regular sheet of paper or larger and all are double sided or have several pages. A few are different ads for the same candidate or proposition. I know that there has to be some kind of positive result for candidates to keep sending these out, along with paying the expense of them, but I feel like they are really a big waste of money and paper. As a fairly knowledgable voter, these do absolutely nothing to sway my vote (and even less so since I already voted last week) and really only further irritate me on the waste of money that is a political campaign. I don't know if junk mail like this is helpful to the undecided voter in the internet age. I wish they'd eliminate it as it seems like such a waste. 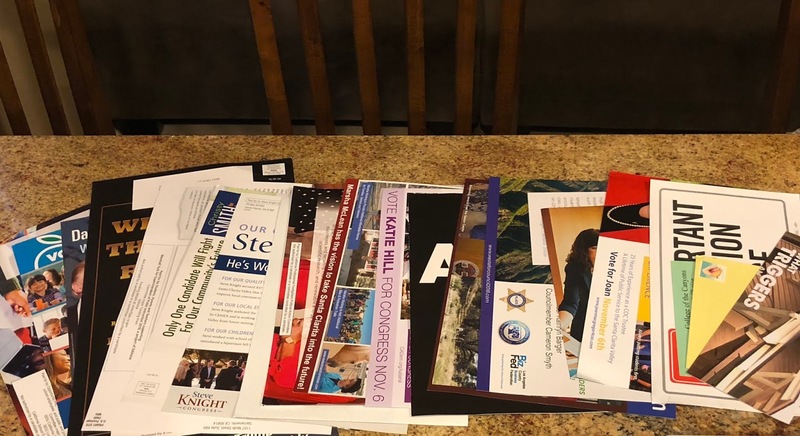 What's your take on campaign mail? Does is sway you? Here we can put a NO Fliers on the door and tell the Post Office that too and we get none. But I am a bit more nuanced. If we all do that then they might reduce the postal service like the truly want to do. What they would really like is to have a single mail box container like you see in apartment block' only bigger that has a box for everyone in the catchment and you come and collect yourself. Then if you want to the door service you pay extra. That's very nice to be able to do, but I get where you are coming from. Delivering junk mail is at least half their job, I would think...at least at my house. My neighborhood has those community mailboxes you mention. The older neighborhoods have mailboxes at/on the door or at the end of the driveway, but anything new is apartment style. They can open up the whole box, pop everyone's mail in, close it, and then each house can access their own via key. Door service isn't an option. I think my biggest problem with this kind of mail is that we've been getting it FOR MONTHS. If it were only a week or two it would be one thing, but the fact that these politicians get to campaign for as long as they do and spend the money that they do, by the time the election arrives we're all so sick of it. No, and I hate it. I cringe at the huge amount of money spent on campaigns. ME TOO! It's ridiculous. I feel like that is the root of all evil in our politics/government these days. If they didn't have to spend their entire time in office campaigning to get money they may actually have time to run the country rather than whatever they are doing right now. We don't get much campaign mail.. thankfully. Though I would be surprised to hear someone actually be swayed by campaign mail..
Oh wow! You are very lucky. We have a few districts that could flip from red to blue this year, so the ads have been non stop, from both parties. Me too! Campaigns in general actually.